My friend and colleague Tom Page wrote The Man Who Would Not Die - twice. No, I'm not referring to the multitude of drafts, experimental and otherwise, that any writer generates when producing a book. 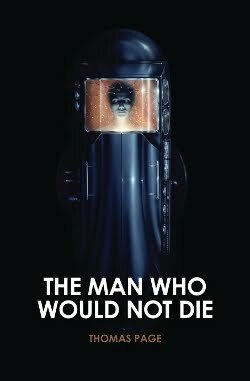 Back in 1981, Tom first wrote, and then Seaview Books published, what has now become a cult sci-fi classic about a handsome rake on inconveniently non-terminal life support. Then came a Signet edition, then one from Hamlyn. Fast forward through intevening years, when predicably but unaccountably, the movie almost got made several times (it's still trying to climb out of the Hollywood ooze). Then came a phenomenon that sounds a like a writer's fantasy - well into the twenty-first century, a mainstream publisher decided to resurrect the works of the venerable Thomas Page. First with The Hephaestus Plague, and now with The Man Who Would Not Die, the virtuous, fan-centric Trashface Books of Dublin, Ireland has come out with high-quality trade paper editions of these creepy cult faves. Which brings us to the second writing. As Tom discussed the new release with Trashface (which itself sounds like the name of some misunderstood Marvel hero), he resolved to "freshen" it. After all, a futurist novel set in the early 1980s might not seem so bleeding-edge without a few zombie-pancake touch-ups. So the rejuvenated book is replete with cell phones, laptops, slick interactive displays, microciruitry, nanotechnology, and genetic engineering. None of this was absolutely necessary to keep this sci-fi story alive - but it keeps it from smelling old. Without this infusion of new blood, a new generation of iPad readers might think the technology of thirty years ago quaint, if not downright odd. As he did in The Hephaestus Plague, Tom spins a central metaphor that goes to the heart of social pathology. With the bugs that spewed fire, he concocted a race of beings better equipped than humans to survive the end times on a resource-depleted planet. With the Stendahl Holmes Life Support (LS) capsule, he's mocking a healthcare system that goes to heroic lengths to prolong life, with less regard for the quality of the result than for the seeming miracle of the achievement. Congratulations to Tom Page on yet more proof of his literary agelessness. He's a bit of a contrarian, too. Why else would protagonist Kate make sure she had plenty of film for her camera?